We are pleased to offer a range or replacement filters and RO membranes for most Hydrotech brand reverse osmosis systems. If you are in doubt regarding which filters are best suited to your Hydrotech RO system, please call us toll free at 1-866-376-2690 for assistance. 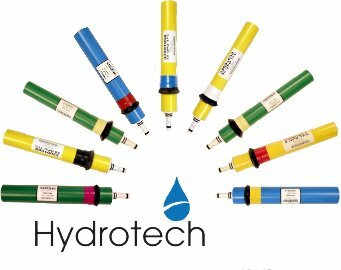 All of our Hydrotech filters and membranes are original equipment, brand-name filters from Hydrotech - we do not sell inferior knock-off filters. A carbon block filter designed specifically for Hydrotech reverse osmosis systems. A special combination sediment and carbon block filter designed specifically for the 3-Stage Hydrotech reverse osmosis system.